Instead of calling upon the mighty God of the universe and believing Him for the supernatural, we go aimlessly on our way — spiritually impotent, unbelieving and fruitless. Oh Lord, Creator of heaven and earth and of the sea and everything in them — you spoke long ago by the Holy Spirit through our ancestor King David, your servant, saying, ‘Why do the heathen rage against the Lord, and the foolish nations plan their little plots against Almighty God? The kings of the earth unite to fight against him, and against the anointed Son of God! That is happening here in this city today! For Herod the king, and Pontius Pilate the governor, and all the Romans — as well as the people of Israel — are united against Jesus, your anointed Son, your holy servant. They won’t stop at anything that you in your wise power will let them do. And now, O Lord, hear their threats, and grant to your servants great boldness in their preaching, and send your healing power, and may miracles and wonders be done by the name of your holy servant Jesus. Is it any wonder that God used these first-century Christians to change the course of history? They knew and served the mighty, all-powerful, sovereign, loving God of the universe. The God whom you worship and serve is the same all-wise, all-powerful, loving God and Father whom they loved and served. His power has not changed — He longs to do the same through you and me that He accomplished through those first-century believers. During the very first sorority meeting at UCLA after the prayer chain began, more than half of the sixty women present expressed a desire to receive Christ. Over the next few months, more than 250 students at UCLA — including the president of the student body, the editor of the newspaper and a number of top athletes — committed their lives to Jesus Christ. So great was their influence for Christ that the campus chimes began to play Christian hymns at noon each day! This unprecedented demonstration of God’s blessing was no accident. God was responding to the prayers of many of His children. His blessing continues to this day as He is using Campus Crusade for Christ to help introduce tens of millions of people to our Savior and then build disciples in all the major countries of the world. Prayer continues to be our major emphasis. Someone has said, “Prayer is a dialogue between two people who love each other — God and man.” Simply put, prayer is communicating with God. Every Christian has a direct line of communication with God, available at all times. But most Christians never lift the phone off the hook and often forget the line exists until an emergency arises. Prayer is much more than words, however. It is an expression of the heart towards God. It is an experience, a relationship, not an activity. Because the one to whom you pray is the King of kings and the Lord of lords, the Creator of heaven and earth, you come into His presence with reverence. But He is also your loving heavenly Father who cares for you and delights in having fellowship with you. Therefore, you can enter into His presence with a relaxed joyful heart, knowing God loves you more than anyone else has ever loved you or will ever love you. To me, real prayer is simply communicating with God, inviting Him to talk to you as you talk to Him. There is more to prayer, but this is basic to true prayer. Man instinctively prays whenever He is faced with tragedy, heartache, sorrow or danger — even if only to false gods made of wood, stone, or His own fallen imagination. We, who with unveiled faces all reflect the Lord’s glory, are being transformed into His likeness with ever-increasing glory, which comes from the Lord, who is the Spirit. This explains the scriptural emphasis on the worship of and prayer to the only true righteous, holy and loving God. Do not feel this way. God listens to the prayer of any truly repentant individual. He proved His love for us by sending Christ to die for us while we were still in our sins. There is nothing that you or I can do that will cause God to stop loving us. The fact still remains, however, that you cannot expect God to answer your prayers unless you come to Him in the name and authority of the Lord Jesus as your only mediator and confess your sins and receive Him as your Savior and Lord. Those who have clean hearts can pray. You must not only ask in the name of Jesus. You must also come with a clean heart. The psalmist says, “If I regard iniquity in my heart, the Lord will not hear: Therefore, you cannot expect God to answer your prayers if there is any unconfessed sin in your life. Just as the omission of one ingredient in a cake recipe can result in failure, so the omission of confessing any known sin can result in prayer failure. In our Lord’s prayer, the words “give” and “forgive” occur in the same context: “Give us today our daily bread. Forgive us our debts, as we also have forgiven out debtors.” No prayer except the prayer of confession can be answered by God unless it comes from a heart that is free of unforgiveness and bitterness. The well-worn compromise, “Well, I can forgive, but I can’t forget,” only defeats your prayers. What if that were God’s attitude? His love has prompted a wonderful forgetfulness in which He has pledged to put all of your sins behind His back and remember them against you no more. You and I must come to God with a forgiving heart if we are to receive the Christian’s legacy of power in prayer. Those who pray in faith can pray. You must also have a believing heart if your prayers are to be answered. The same Lord who says, “All authority in heaven and on earth has been given to me” and, “Surely I am with you always, to the very end of the age” also says, “You may ask me for anything in my name, and I will do it” and, “If you believe, you will receive whatever you ask for in prayer” and, “According to your faith will it be done to you.” Yet few of us take seriously these words, and few dare to claim what God has so generously promised us. 3. Why Are You to Pray? You pray because God commands you to pray. The New Testament commands to pray are many. Here are a few; Pray continually. Watch and pray. Pray with thanksgiving. Pray in the Spirit. Always pray and not give up. Pray for those in authority. Pray for utterance. Pray for boldness. You pray because of our Lord’s example. Jesus Christ, the very Son of God, was obedient in prayer. Although His day was filled from morning to night with many pressures and responsibilities — addressing crowds, healing the sick, granting private interviews, traveling and training His disciples — He made prayer a priority. If Jesus was so dependent upon this fellowship in prayer alone with His Father, how much more should you and I spend time alone with God! You pray because of the examples of the disciples and others. The lives of the disciples and the biographies of Christians who have been mightily used of God through the centuries all testify to the necessity of prayer. They, too, are examples of obedience to His command to pray. I’m not suggesting that you need to spend long hours each day in prayer, though some are called to this high privilege. But you can “pray continually,” bringing everything to God in prayer. Those who obey God’s command to pray are mightily blessed and used of God. You pray to have fellowship with God. God waits anxiously for you to come to Him in prayer. Proverbs records, “The prayer of the upright is His delight.” This should motivate you to spend more time with our Lord because you wish to please and delight Him. My own sons help me to realize the importance of this fact. No matter how busy I am, when Zachary or Bradley want to talk with me, I gladly put aside everything else just to have fellowship with them. I long and love to be with them, and I am always grateful when they want to be with me. One day, many years ago as I was studying in our home, Zachary appeared with a stack of books and sat down across from me at the table. Although neither of us spoke, I sensed the warmth of His love. I finally broke the silence by saying, “Zac, I want you to know how much it means to me that you have come to sit with me.” He replied, “Daddy, that’s the reason I came. I just want to be near you. For the first time in my life, I really understood how the great heart of our loving God delights in us and longs for our fellowship. You pray to communicate with God. He said, “Call to me and I will answer you and tell you great and unsearchable things you do not know.” Prayer is not just an “escape hatch” for you to get out of trouble, please yourself or gain your selfish ends. It is your line of communication with God. As His child, you have direct access to His throne. He loves you so much that He has made Himself available to you at all times. Through prayer you talk to God and He responds to you. You pray to receive spiritual nurture. Just as a child needs food to grow physically, so you need food to grow spiritually. You can miss a meal and not feel any ill effects, but if you go without food for a week, you begin to weaken and run out of energy. So it is with your spiritual life. You can go through one day without any apparent ill effects, but if you continue this practice, you will become undernourished, losing the strength to live a victorious life and to maintain the boldness necessary for a vital witness for Christ. You pray to obtain results. Genuine, biblically-based prayer does change things. It so changes those who pray that God is free to reveal His will to them. Prayer also releases God’s great power to change the course of nature and people and nations. The faithful prayers of Spirit-filled, believing Christians have proven this many times over. Many buildings on the grounds of Arrowhead Springs, our international headquarters, including the bungalow where Vonette and I live, came extremely close to being engulfed in flames during a terrible brush fire several years ago. Seven of the buildings were destroyed. After evacuating the grounds, a group of people who remained to fight the fire prayed earnestly at about two-thirty in the afternoon that God would turn the ninety mile-per-hour winds away from the buildings. Precisely while they were praying, one of the firefighters observed the flag snapping violently in the wind. Suddenly, the flag began to turn and within moments was flapping in the opposite direction. They all were awestruck at what God had done before their very eyes. Urgent word also came to Vonette and me at about two-thirty that the flames had enveloped the campus of our headquarters including our bungalow. We, too, got on our knees and began to pray that God would turn the winds. Those who were fighting the fire reported that the heat and smoke became so intense, they were forced to lie on the ground in order to breathe as they sprayed water on the buildings. At about two-thirty they were at the point of abandoning our bungalow to the flames surrounding it on three sides — when suddenly the winds miraculously shifted and swept the flames in another direction. Many similar, dramatic answers to prayer could be shared. Yes, prayer truly changes. You pray to become a fruitful witness for Christ. The divine order is first to talk to God about men and then to talk to men about God. Witnessing is simply gathering the results of prayer, both the prayer of the one who is sharing Christ and the prayers of others. I am convinced that the single most important factor in my becoming a Christian was the prayers of my godly mother. 4. To Whom Do You Pray? Your prayers are validated by Jesus Christ and are interpreted to God the Father by the Holy Spirit. But since God is one God, manifested in three persons, it is perfectly acceptable to pray to Jesus or to the Holy Spirit. There is no jealousy between the three persons of the Trinity. But the scriptural pattern which Jesus taught addressed the Father. 5. When Should You Pray? There is a sense in which I pray without ceasing, talking to God hundreds of times a day about everything. I begin my day on my knees in prayer, worshipping, praising and adoring our great and gracious Creator, God and Father. I acknowledge Jesus Christ as my Lord and Master. By faith, as an act of my will, I appropriate the fullness of the Holy Spirit. I pray for wisdom about the numerous decisions I must make that day. I pray for the salvation of friends and strangers, the healing of the sick, and the spiritual and material needs of the Campus Crusade for Christ ministry, as well as the needs of various members of the staff and leaders of other Christian organizations and their ministries. I pray for our leaders and for those in authority over us. I even pray about small personal matters that are of concern to me alone. And God answers! I then like to spend whatever time is appropriate reading and meditating on God’s Word. I often kneel quietly before the open Bible and talk with God. I ask the Holy Spirit, who inspired its writings, to make my reading meaningful and edifying to me. As I read, I pause to thank God for His loving salvation and provision, to confess any sins in my life that the Scriptures may reveal, to ask Him for the boldness and faith His apostles displayed, and to thank Him for new insights into His divine strategy for reaching the world with the good news of His love and forgiveness through Jesus Christ our Lord. I often pause to pray about some special truth or claim a promise. In the evening I kneel once again to worship my Lord, to read His Word and to ask of Him, “Lord, is there anything in me that is displeasing to You, anything I need to confess?” If the Holy Spirit reveals any sins and weaknesses, I confess them and claim by faith God’s victory for my life. Then I can know that since my last conscious thoughts are of Him, my subconscious thoughts will continue to worship Him all night long. Thus when I awaken, my first thoughts will be of our dear Lord. Group prayer also is vital to the Christian’s prayer life and yet few meetings are more dull, unattractive and boring than the average group prayer meeting. The reason is simple. The majority of Christians involved in the group have not spent time with God in private worship and prayer; consequently, they have nothing to say to Him in public except memorized prayers patterned after older Christians who have learned their way of praying from still others. How much more exciting it is to teach the group to talk to God as though He were actually present, as indeed He is. This permits spontaneous, Spirit-directed prayer in which one area of praise or petition at a time is brought to Him as the Spirit brings subjects to mind. One very rewarding way to pray in small groups is to pray through favorite passages of Scripture verse by verse with each person limited to a 30-second-or-less prayer. But there are special times of Spirit-directed and anointed prayer which may last for hours but seem like only minutes. ACTS: An easily remembered acronym for prayer. 6. What Should Be Included in Prayer? However, “ACTS” is merely a guideline and not a rigid sequence which you must follow in your prayers. Let’s consider each of these words. To adore God is to worship and praise Him, to honor and exalt Him in your heart and mind and with your lips. Prayer is often misunderstood as a vague, mystical element in one’s relationship to a holy, awesome God. But the Word of God does not teach this. Rather, it teaches that God, our Father, desires the fellowship of His children. Your relationship to your heavenly Father should be one of complete trust, faith and obedience. Likewise, your prayer should express your complete trust in Him and reflect your confidence that He hears you. As a result, you approach Him in adoration and praise, with reverence and awe, with love and gratitude. Reading aloud psalms of praise and other similar portions of Scripture can greatly enrich your prayer time. A cold, ungrateful heart will soon be warmed, and praising God will come easily. Personally, I cringe at such references to God as “the Man upstairs,” for the God whom I worship is one whom I also honor and reverence. He is the omnipotent, holy God, creator of all things. Yet, I feel perfectly free to open my heart to Him — to share my deepest heartfelt needs, knowing that He is not only the omnipotent, holy God, but He is also my loving heavenly Father. He loves me more, understands me better, and believes in me more than anyone else in all the world. I happen to pray in just about every conceivable posture: with my eyes open or my eyes closed, while I am walking, while I am lying in bed, audibly and silently. But my favorite posture is on my knees. The first thing I do when I awaken in the morning is to kneel and acknowledge that the Lord Jesus is in control of my life and thank Him that He loves me and is living His life in and through me in all of His resurrection power and presence. I invite Him to continue His ministry of “seeking and saving the lost” through me, to use me in whatever way is pleasing to Him. Listen now! The Lord isn’t too weak to save you. And He isn’t getting deaf! He can hear you when you call! But the trouble is that your sins have cut you off from God. Because for sin He has turned his face away from you and will not listen anymore. If your discipline of prayer begins with worshipful adoration of God, the Holy Spirit will reveal any sin in your life that needs to be confessed. By seeing God in His purity, His holiness and His love, you become aware of your own sin and unworthiness. As the Holy Spirit makes you aware of sin, you will want to confess it. Always be totally transparent with God. Don’t wear a facade or put on an act. He already knows everything about you. So tell Him exactly how you feel at all times. If you do not feel spiritual, tell Him so. If your heart is cold, confess it. If you have been disobedient, confess it and receive His forgiveness and cleansing which will restore you to fellowship with Him. The writer of Hebrews makes it clear that without faith it is impossible to please God. God’s Word commands, “Give thanks in all circumstances,” because “this is God’s will for you in Christ Jesus.” To fail to give thanks is to disobey God. May I suggest that you meditate quietly on all of your daily blessings, such as your salvation through knowing Christ, assurance of sins forgiven, the opportunity to serve Christ, the chance to go to school, your good health, family of loved ones, a good job, food and clothing? Thank God for each one of them. Then make a list of each problem, disappointment, heartache or adversity which concerns you, and thank God in spite of each one of them as you are commanded to do. Giving thanks demonstrates that you really do trust God. Expressing your faith pleases God and enables Him to make Himself strong in your behalf; whereas a critical, unbelieving spirit displeases God and hinders His efforts to bless and enrich your life and to use you for His glory. As you talk to God, pray that your inner person may be renewed and quickened — be made alert and alive, vital, refreshed, always sensitive to and empowered by the Holy Spirit. Pray about your problems, pray for wisdom and guidance, pray for strength to resist temptation, pray for comfort in time of sorrow — pray for everything. There is nothing too small or too great to bring before the Lord. Then pray for others. Christians often do not realize the importance of intercession. The apostle Paul continually prayed for his converts. He also asked them to pray for him. You should pray for other Christians and encourage them to pray for you. Let me illustrate the importance of this. In 1960 the Mau Mau uprising gripped Kenya in terror. During that time, missionaries Matt and Lora Higgens had to drive through the heart of Mau Mau territory on their way to Nairobi. They were well aware that both Kenyans and missionaries had met violent death at the hands of Mau Mau terrorists in that very area. Matt and Lora were thrilled — and puzzled. “What 16 men?” they wondered. Always pray daily for your husband or wife, for your children and for your parents. Then pray for your neighbors and friends. Pray for various other Christians to whom God has given special responsibility. Pray for presidents and kings and for all those in authority over you. Pray especially for the salvation of souls, for a daily opportunity to introduce others to Christ and to the ministry of the Holy Spirit, and for the fulfillment of the Great Commission in our generation. Begin with your campus or your community. Pray for and seek to find one or more Christian friends with whom you can establish prayer partnerships. Don’t underestimate the power of intercessory prayer for the salvation of souls. My mother and father were married for 35 years before he received Christ. Their love for each other was strong, but dad’s indifference to the Lord must have caused my mother to experience much heartache and shed many tears. Nevertheless, she kept praying — for him, and for my brothers and sisters and me — until finally she began to see results, and our entire family had received the Lord. I prayed for several years for my fiancée, Vonette Zachary, to receive Christ. When we became engaged, I just knew she was God’s choice for me. She had been very active in the church from her youth, and I assumed she was a Christian. As time passed, however, I began to realize that Vonette was a church member but probably not a Christian. There was very little evidence that she had given her life to Christ. So I prayed earnestly for her salvation. Since I had surrendered my life to the Lord before I proposed to Vonette, I dared not marry an unbeliever. Doubts grew and I began to wonder if it was really God’s will for me to marry this wonderful and beautiful young woman to whom God was not a reality, even though I loved her dearly. Then one summer day at a Christian retreat to which I invited her, Vonette surrendered her life to Jesus. My prayers were answered; we were married soon afterward, and we have since spent more than four God-blessed decades together in a wonderful, Christ-centered marriage. So I can identify with you if you have been praying for a son, daughter, spouse or friend and have not yet seen results. And I encourage you to trust in God’s timing. Although I wanted Vonette to receive Christ right away, God chose to wait 3 years — a different time table — one that brought greater glory to Himself. He is sovereign and will answer your prayer in His special way, at His special time. I encourage you to receive this special word of assurance from God: He desires the soul of your loved one, friend or neighbor even more than you do. Just claim the promise of 1 John 5:14, 15, “We are sure of this, that He will listen to us whenever we ask Him for anything in line with His will. And if we really know He is listening when we talk to Him and make our requests, then we can be sure that He will answer us.” Then pray for your loved ones and friends with confidence that He will hear you and answer your prayers as He promised. The ACTS pattern — Adoration, Confession, Thanksgiving and Supplication — has helped many Christians to develop a more well-rounded prayer life in communication with their loving God and Father. Follow 4 imperatives as you expect God to answer your prayers. Jesus says abiding is the key to successful praying. 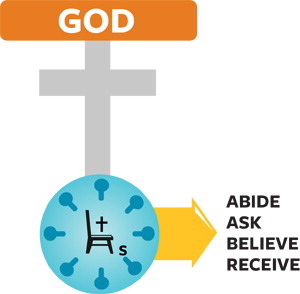 “If you abide in me, and My words abide in you, you will ask what you desire, and it shall be done for you.” in other words, if you are abiding in Christ — if your life is totally yielded to Him and His Word is abiding in you so that you know His will — you can ask anything you want because your will is to do His will. Abiding, then, is simply living a life of faith and obedience in the fullness for the Holy Spirit, surrendered to the Lordship for Christ with no unconfessed sin, and being totally available to God. The unsolved problems in the world are so great they are almost without number. People are still sick; souls are yet unreached for Christ; evil people still wield ungodly political and financial power; and many injustices continue — largely because the children of God do not ask! Jesus promises in Matthew 21:22, “If you believe, you will receive whatever you ask for in prayer.” Believing is at the heart of answered prayer. But how do you get this faith to believe? Should you try to work up some kind of state of mind that will in some way equal faith? Of course not. If you have faith as small as a mustard seed, you can say to this mountain, “Move from here to there” and it will move. Nothing will be impossible for you. James instructs you to “ask in faith without any doubting” for the double-minded person cannot expect God to answer His prayers. You see, it’s the quality, not the quantity, of the faith that is important. Faith comes from God. It is not something you try to muster on your own. A life of faith is experienced only by those who walk in obedience. You cannot be on the throne for your life and still pray in faith. You will never meet a person who has great faith in a great God who refuses to obey the God in whom he is commanded to place his trust. 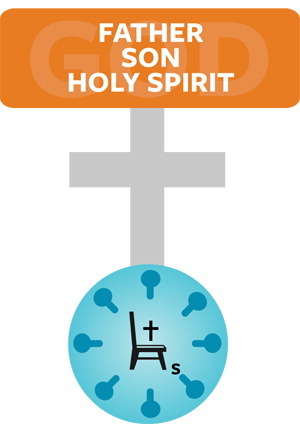 The Holy Spirit uses 3 basic means to produce faith in the one praying. Second, He uses fellowship with other Christians and various circumstances and experiences. For example your faith in God grows as you observe a friend being used of God to introduce others to Christ. When he shares his experience with you, this encourages you to believe that God can use you, too. For example, five young high school students began to sense their responsibility to God according to Matthew 28:18-20. Each of these students felt impressed to make a list of three friends whom he wanted to claim for Christ. The first week they met daily to pray that these friends would sense their need of God. The second week they prayed to be instruments of God. The third week they prayed for opportunities to speak to their friends about Christ. That week fifteen students received the Savior. By faith, claim the answer to your request. If you know you are abiding in Christ and are controlled by the Holy Spirit and are praying according to the Word and will of God, you can expect God to answer your prayer. So be prepared to receive the answer. Imagine right now that you are receiving the answer to your request, and begin to thank God for it. In 1954 Roger Bannister broke the 4-minute mile. It had never been broken in all the centuries of recorded history, but Bannister believed it could be done. He developed a mental picture of himself breaking the four-minute mile record, and he did it. Since 1954, several hundred other athletes have broken the four-minute mile, simply because Roger Bannister proved that it could be done. If an individual with only human resources is able to accomplish outstanding success, how much more can you accomplish when you place your faith in the omnipotent God and draw upon His supernatural, inexhaustible resources? It is a simple fact that whatever you vividly envision, ardently desire, sincerely believe and enthusiastically act upon must inevitably come to pass — assuming, of course, that there is scriptural authority for it. Consider, for example, the Great Commission. For many years since that memorable moment when God gave me the vision for his ministry and for the world, I have been strongly impressed that the Holy Spirit wants the Great Commission fulfilled in our generation. Since that original deep impression in 1951, the Great Commission has been my number one priority as an expression of my love for our Lord and my desire to obey Him. I have a vivid mental picture of what fulfilling the Great Commission will involve — saturating a world of more than 6 billion people; discipling tens of millions; training key leader representatives in every one of the 210 nations and protectorates of the world; and using every modern means of technology — science, radio, television, satellites, jet travel, high-speed presses and audio-visuals in all forms — to communicate God’s love worldwide. Our strategy of accomplishing this goal was called New Life 2000. Christians from North America, Europe and more than 150 nations around the world were a part of this comprehensive plan for world evangelism. Millions of believers within thousands of churches, denominations, organizations and mission agencies united to make New Life 2000 a priority for their evangelism and discipleship ministries at home and abroad. I see clearly with my mind’s eye a day in the immediate future when billions of people on earth will become aware of the great truths concerning God’s love and forgiveness in Jesus Christ and will crown Him Lord of lords. I know that the fulfillment of the Great Commission is the will of God because it is His command and the desire of His heart, and I ardently long to have it come to pass. Furthermore, I sincerely believe that the Great Commission will be fulfilled because it is God’s idea, not man’s. It is inconceivable to me that our Lord would have given us the command without giving us the needed resources with which to fulfill his command. And finally, because I so vividly imagine, ardently desire, and sincerely believe in the fulfillment of the Great Commission in my generation, I can enthusiastically act upon it by giving myself completely to the task and helping to mobilize millions of others toward its fulfillment. In your own life — your own home, community, state, nation and the world where you personally are concerned — determine, on a clearly scriptural basis, what God would have you vividly imagine, ardently desire, sincerely believe, and enthusiastically act upon to help fulfill the Great Commission. It may be that, in addition to your own personal ministry, God would have you pray for the personnel of a radio or television station or a newspaper to be an influence of righteousness. It may be that He would have you claim for Him a high school campus, a college campus, an office, or a community; or that every person within the radius of a mile of your home, or every home within the entire city would be personally visited by trained workers who would lovingly, prayerfully and intelligently present the claims of Christ. Remember that, as you bow in prayer, you are tapping a source of power that can change the course of history. God’s mighty power, His love, His wisdom and His grace are available to you if you will but believe Him and claim them. Remember always, Jesus promised that you would do the same miracles which He did, and even greater ones. Will you join with us in praying for the Lord of the Harvest to send forth millions of disciples to work with thousands of local churches of all denominations and with various movements and organizations who desire to see the Great Commission fulfilled in this generation? Will you pray also for a mighty outpouring of God’s Holy Spirit upon the entire world and for the money and material needed to fulfill this God-given task? Prayer is the greatest privilege of the Christian life and the most revolutionary source of power known to man. If you were to take seriously the promises of God and begin to claim by faith in prayer all that you have been promised, miracles would attend your way, multitudes would be introduced to our Lord Jesus Christ, the whole course of history would be changed, and you would help to fulfill the Great Commission during your lifetime. Remember, How You Can Pray with Confidence is a transferable concept. You can master it by reading it six times; then pass it on to others as our Lord commands us in Matthew 28:29: “Teach these new disciples to obey all the commands I have given you.” The apostle Paul encouraged us to do the same: “The things you have heard me say in the presence of many witnesses entrust to reliable men who will also be qualified to teach other” (2 Timothy 2:2). Learn more about how to pray with confidence with these study guides. What is prayer? Why is prayer important? Whom does God hear when they pray? Why would unconfessed sin hinder or halt your prayer life? What do these verses teach about how to pray? What vital elements of prayer are found in Acts 4:24-30? What vital elements of prayer did Christ include in his prayer in John 17? What part does prayer have in witnessing? How would you explain the elements of the model prayer Christ gave his disciples in Matthew 6:9-13? When should you pray? Is one time “better” than any other? What are some of the promises Christ makes to you when you pray? What are the four parts of prayer in 1 Timothy 2:1? Explain briefly what each one means. What important prerequisites to effective prayer do you find in these verses? What does it mean to be prepared to receive God’s answers to your prayers? What promise does James 5:16 give us? A prayer journal is an effective way to record God’s faithfulness in answering your prayers. Start a journal this week by recording your daily requests. Then enter God’s answers as they come. 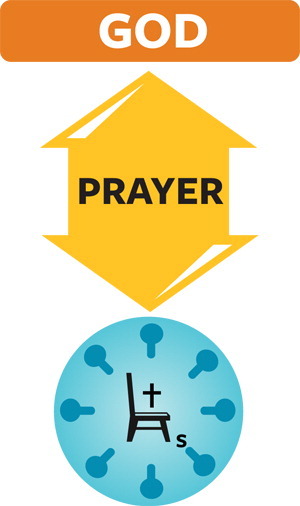 Review the importance of prayer in the founding of Campus Crusade. What project is your group currently initiating (or already involved in)? How can you effectively mobilize your group to provide the prayer support you need? The Scripture commands us to “pray continually” (See 1 Thessalonians 5:17). Discuss with your group how you can make this a habit in your daily life. Share some of your creative ideas for quiet times and personal prayer times. Prayer changes things — and people. By way of encouragement, share with your group an answer to prayer which you have experienced that has changed a situation or person. What are some specific prayer requests you want to believe God for? Share these with your group and identify some promises from Scripture that you can claim for each request. With your group, devise a prayer strategy to help fulfill the Great Commission in your community. Adapted from the Transferable Concept: How You Can Pray with Confidence, by Dr. Bill Bright, co-founder of Campus Crusade for Christ. © Campus Crusade for Christ. All rights reserved.